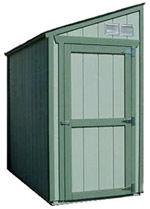 The "SHED" style has a single pitch, lean-to roof that is ideal for tighter spaces. 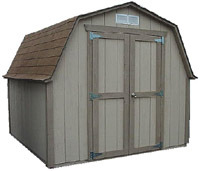 This style is offered in a 4' or 6' wide roof rafters. Doors can be located on either the 4' or 6' endwall or longer sidewall. The "HOUSE" has a gable style roof. The standard "HOUSE" includes 6'3" interior sidewall height, the "Tall House" includes a 7'8" interior sidewall height. Door placement can be customized to accommodate most sites. 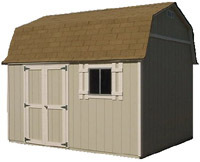 The "BARN" style has a gambrel roof design and is available in three different heights. The standard "BARN" includes a 4' sidewall height, the "TALL BARN" has a 6' sidewall, and the "EXTRA TALL BARN" has 8' sidewall. 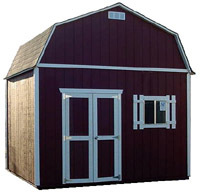 Door placement on standard "BARN" is limited to 8' gambrel end, and "TALL & EXTRA TALL BARN" can customized door placement to accommodate most sites. Foundation: Rows of 2"x8"x16" concrete stones spaced out under 4"x4" pressure treated skids so that no wood touches the ground. This allows for water drainage & ventilation under the floor which can increase the longevity of your floor. Floor: 2"x4" floor joist 16" on center and heavy duty 3/4" tongue & groove, sturdi floor plywood sheathing. A steel threshold protects every door entry. Walls: 2"x4" wall studs 16" on center with double top plates. 5/8" Roseburg Duratemp siding with 8" on center vertical grooves. This siding is a real wood, not a composite, and provides a stronger shear wall then 1/2" thick sidings. Doors: 48" double doors (2- 24" doors) are our standard. Our doors are equipped with 6 heavy duty "T" hinges and a key-locking chrome finished "T" handle.